Bahia: Music... Religion... Dance.... Art.... Cuisine... The culture of Africa first came to the New World through Brazil and it is there where it has been best preserved and continues to hold tremendous influence on all aspects of Brazilian modern life. Despite its heavily mixed ethnic heritage, it is the nation's African roots that provide Brazil its soul, rhythm and character and distinguishes Brazil from most other travel destinations. An exotic land set on Brazil's sultry, tropical Northeast coast, the state of Bahia is a land of palm trees, virgin beaches, warm people and vibrant culture. Bahia's charm, found throughout its charming cities and villages, helps to define the exceptional vacation experience offered by the region. Salvador - The oldest city in Brazil and its first capital, Salvador was a major post for the slave trade and is now a thriving center of Afro-Brazilian life. Salvador is considered the country's soul and the birthplace of Brazilian culture. The most African of the Brazilian cities where nearly 80 percent of its population possess African origin, Salvador offers a mixture of culture and history all its own. The local cuisine, music, dance and vibrant visual arts are all testaments to this pervasive African influence. Considered Brazil's most artistic city, Salvador has a lively art scene and its streets are filled with dance and music all year round. Certainly, the soul of Brazil. This is the very birthplace of today’s Brazilian culture. You will feel transported to a place quite unlike any you have ever visited before. Morning: Arrive in Salvador da Bahia, meet and transfer to your selected hotel. The Bahia Folklore Company (Balé Folclórico da Bahia) is one of the most respected folklore dance troupes in the world. The company performs in the intimate Miguel Santana Theatre in the Pelourinho in a seamless presentation of the multiple African traditions that underpin Bahian culture. We will see the sacred dances of the Candomblé; puxada de rede, a song by fishermen in honor of Yemanjá, the goddess of the sea; maculelê, an acrobatic stick and sword dance with its origins in the cane fields; capoeira, a martial art/dance of Angolan origin and the samba de roda, a spinning, swirling version of this exuberant national dance. Dinner will be served in one of the many restaurants in the Historic Centre. We will trace the African roots of Salvador on a city tour that includes both the newer, modern section and the older Historical Center of Salvador, the Pelourinho, named after the pillory that stood in the main square. We will visit the Afro-Brazilian Museum which traces the West African origins of the city and see the superb wooden, sculpted panels of the orixás by Salvador's most celebrated artist, Carybé. We will visit the Church of Our Lady of the Rosary, the famous Black church, built with meager resources over a period of nearly 100 years. (Currently closed for restoration but due to open Dec 11). The Casa do Benin (Benin House) nearby further investigates this permeating African influence. We look in on artists and sculptors at work and let the senses do the rest as we soak up the feel of this vibrant city. We leave the city behind to explore the farm hinterland on the western side of the All Saints´ Bay. This is the land of sugar cane plantations, peaceful colonial towns and busy country markets, a day full of insight into the lifestlye of rural Brazil. We drive north out of the city and head westwards, stopping in the country market town of Santo Amaro. We continue our drive westwards through the rolling hills to Cachoeira, the jewel of the Bahian hinterland nestled deep in the valley of the Paraguaçu River. After lunch we take a walking tour of the town, with opportunities to browse in some local wood carvers stores’. Like Salvador, Candomblé plays an integral part in the life of the town, epitomized by the Sisterhood of the Boa Morte, a sorority which traces its origins back to the time of slavery. We cross to the western bank of the slow moving river and visit the Danemann Cultural Center where world class cigars are expertly rolled. This tour is truly a journey back in time to the Brazil of yesteryear. 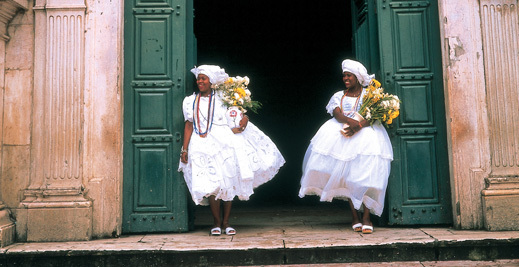 Daytime: Candomblé - Religious and Social Focus(half day). The most deeply felt African influence in Salvador, in this, the most African of Brazilian cities, is the Candomblé, the worshipping of the ancestral spirits or orixá's. The orixá 's can be thought of as an enlarged family with a common background which encapsulates the living and the dead. The orixá is a deified ancestor who, when alive, established links which guaranteed him or her control over certain natural forces, e.g. thunder, the winds, or the sea; or which allowed him or her the possibility to exercise certain activities such as hunting or working with metals; or somebody who learnt the properties of plants and how to use these properties. This force (or AXÉ, pronounced ah-shay) of the ancestral orixá would have, after death, the power to incarnate itself in one of his or her descendants through the sacred rhythms, dances and songs of the Candomblé used to invoke these spirits. A popular greeting in Bahia is Axé!, a kind of "may the force be with you!" and this Axé is the driving force of Salvador and Bahia. We visit a traditional candomblé house of worship, established at the turn of the century, a long way from the then center of the city. The expansion of the city has meant that the temples grounds have been surrounding by the burgeoning metropolis but the temple maintains the traditional religious and social values of African daily life.Our visit will focus on the religious and social traditions of the temple. We visit the primary school whose curriculum includes Yorubá language studies, the study of the spiritual and medicinal properties of sacred plants, as well as the normal academic studies. Daytime: This day is dedicated to experience the brazilian culture. You can choose from one of the following Workshop: capoeira or percussion. Capoeira: The traditional Capoeira Angolan is the slower and subtler of the two forms of the martial art where the hands are often used to support the body while the feet deliver blows. One is considered a good capoeirista by the manner in which one gets one's opponent into a position where he or she is off guard, with great attention on disguising the eventual blow. If points were to be gained in this martial art form they would be gained for the craft and skill used in delivering the blows rather than the blow itself. The word “ginga”, meaning the sleight of hand, foot and body to deliver and avoid blows, is the key here. Like all great martial arts there is a very vital philosophy and way of life associated with being a capoeirista and to become a master demands years of dedication to the finer details of the art. Music plays a very important role in Capoeira and a Roda de Capoeira Angola, the circle inside of which the capoeirista perform, cannot take place without the full complement of 4berimbaus, (a bowed one-stringed instrument and the backbone of the capoeira), one conga, tambourines and an assortment of other percussion instruments. We visit a traditional capoeira school and meet with the capoeira group leaders, learn of thehistory and philosophy, try our hands on the instruments and learn the basic moves. The names of the instruments are as wondrous as their resulting sounds are lifting:· The rhum, rhumbi and lê of the candomblé· The surdo, caixa, timbau and repique of the samba reggae· The agogô, atabaque and maracas of the ijexáVisit to percussion instrument maker's workshop. Workshops will be scheduled and pitched at levels of skills to suit all talents, age groups etc. Evening: Rio Vermelho, referred to by Bahians as the bohemian quarter, embraces the city’s bon vivants with open arms, and in many cases, open doors until the small hours. It is from here that Bahians will head for their night out. The neighborhood has a myriad of bars, restaurants and botecos, (a tapas-like bar), this latter key to the district’s charm.Bahian street food is famous throughout Brazil. The famed acarajé and abará, traditionally sold through the city by baianas de acarajé from their colorful stalls, washed down with a cool drink is a favorite pastime for locals. Rio Vermelho is home to 3 of the city’s most famous treasured baianas de acarajéMusic completes the neighborhood’s attractions with a number of bars providing the best in local live music in its many forms, traditional or contemporary.Itinerary:Hotel pick up with local guide and drive to Rio Vermelho, where the first stop will be to savor the acarajé and a cool drink. Then move on to a busy boteco to savor some of the local delicacies and finally pop in to catch one of the music performances.Included: 01 drink, bilingual guide and round trip transport in private vehicleNot included: Food, drinks (other than the first drink) or cover chargeDepart Hotel: 20:00Return Hotel: 23:00Note: Attractions may vary on the night of the week and time of the year. Daytime: today you will learn about the brazilian culinary. Markets and Cuisine - morning onlyWe visit two of Salvador's busiest markets. The first stop is the newly renovated Fish markets where the wide variety of seafood and fish found in the tropical waters of the bay and he ocean are on display. A short distance away is the largest open markets inBahia, the São Joaquim market, selling a myriad of products and produce, from fruits and vegetables to spare parts for domestic appliances to sacred herbs and religious artifacts of candomblé.Here we find all of the ingredients for Bahian cuisine and later savour the famous moqueca dish in a local restaurant in the city. Day at leisure.Or optional Panoramic City Tour:The Lower City tour offers another perspective of the sprawling city, taking us to the quiet waters of the Itapagipe Peninsula where life moves at a slower pace than the bustling upper city. Fishermen fish from dug out canoes, locals collect shellfish at low tide, schooners lie at anchor, all protected by the famous Bonfim church, one of the most important churches of pilgrimage in Brazil and deeply syncretized with the Candomblé. (visit). We continue to the Monserrat district with its panoramic view of the city and on to the Mercado Modelo, a thriving market for local artifacts and souvenirs. This is also where you can test your bargaining talents! 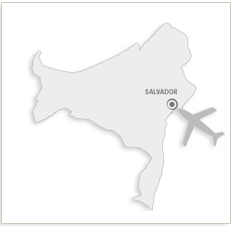 Check out - Transfer to Salvador Airport.